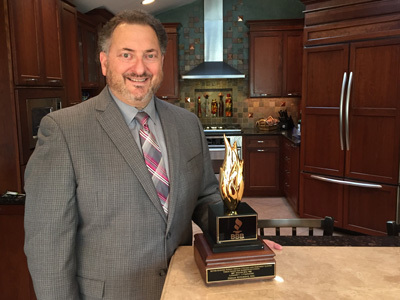 Dream Kitchens, Inc. is pleased to announce today that it has received a 2016 Torch Award for Marketplace Ethics. Dream Kitchens, Inc. won the 2016 Torch Award for Marketplace Ethics for companies with 1-9 employees. The award was presented at a luncheon ceremony on Thursday, November 19th at Loews Chicago in Rosemont. Dream Kitchens, Inc. is a nationally recognized Kitchen and Bath Design Studio, with a showroom located at 806 Central Ave. in Highland Park, IL. Their showroom offers a complete array of cabinetry, countertops, hardware, accessories and tile. Their award winning designers have created exquisite, one of a kind kitchens and baths throughout Chicagoland, for over 24 years. Over the past 3 years, Dream Kitchens, Inc. has become the leading designer of Outdoor Kitchens in Chicago. “At Dream Kitchens, Inc. our reputation has been built on excellent service, superior craftsmanship, and the highest quality products,” said Rick Glickman President of Dream Kitchens.